Cody, W.J.. "Fern". The Canadian Encyclopedia, 24 May 2018, Historica Canada. https://www.thecanadianencyclopedia.ca/en/article/fern. Accessed 18 April 2019. Fern, common name for a diverse group (division Polypodiophyta) of usually perennial, spore-producing plants with divided, evergreen or deciduous leaves (fronds) arising from slender, horizontal rhizomes (underground stems) or stout, ascending rootstalks. Fern, common name for a diverse group (division Polypodiophyta) of usually perennial, spore-producing plants with divided, evergreen or deciduous leaves (fronds) arising from slender, horizontal rhizomes (underground stems) or stout, ascending rootstalks. Tropical and subtropical tree ferns may grow several metres high. Related tree-like species dating to the Devonian period (410-353 million years ago) and reaching highest development in the Carboniferous period (353-300 million years ago), comprised some of the vegetation forming coal beds (see fossils). Recent advances in knowledge have necessitated taxonomic realignments: in N America north of Mexico, 20 families encompassing 65 genera and 345 species are now recognized; 13 families, 31 genera and 114 species have been recorded for Canada. Ferns show alternation of generations, eg, a sexual stage (gametophyte) alternates with an asexual, spore-producing stage (sporophyte). Each stage is an independent plant. Spores are produced in spore cases, which may be naked on a leafless branch, as in primitive Ophioglossum and Botrychium; arranged in clusters (sori) on the backs or margins of sometimes drastically modified leaflets (pinnae), as in several families, eg, Polypodiaceae, Schizaeaceae; or in fruiting bodies (sporocarps), as in Azolla and Marsilea. Spores germinate to form tiny, often heart-shaped plants (prothallia) that bear antheridia (structures producing sperm) and archegonia (structures producing eggs). The prothallia are the gametophyte generation. Fertilization of the egg, and subsequent development, produces the familiar fern plant, the sporophyte generation, and completes the life cycle. Many ferns also reproduce vegetatively (eg, by buds on roots or fronds). Most ferns are tropical or subtropical; Woodsia ilvensis, W. alpina, W. glabella, Cystopteris fragilis and Dryopteris fragrans grow in Canada's arctic archipelago. Ferns are usually terrestrial; some, such as Polypodium glycyrrhiza of coastal BC, are partly or wholly epiphytic (growing on other plants); others, such as Marsilea and Azolla, are aquatic, the latter free floating. Habitats are usually moist. 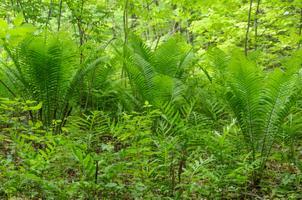 Most Canadian ferns grow in wooded regions, but bracken (Pteridium aquilinum) and hay-scented fern (Dennstaedtia punctilobula) thrive in open areas. Species of Pellaea, with leatherlike blades, grow in dry crevices of cliffs. Most Canadian ferns have relatively wide distributions. Some are restricted in range: curly grass, Schizaea pusilla, grows in Sphagnum moss or wet depressions in NS and Newfoundland; netted chain fern, Woodwardia areolata, in southern NS; hart's tongue fern, Asplenium scolopendrium, is associated with the limestone of the Niagara Escarpment; polypody, Polypodium scouleri, grows along the BC coast, often in reach of salt spray; filmy fern, Hymenophyllum wrightii, forms mats on shaded cliff faces and tree bases from the Alaska Panhandle to Vancouver I. Ferns have little economic value, but many are beautiful. Edible fiddleheads or ostrich fern, Matteuccia struthiopteris, are gathered commercially in NB; this species is also used in foundation plantings. Boston fern, Nephrolepis exaltata cv. "bostoniensis", is a common house plant. Some woodland ferns are excellent for cool, moist, shaded gardens. Bracken, sometimes eaten as a green, has been shown to be carcinogenic in rats and responsible for livestock diseases. It is not recommended for human consumption. W.J. Cody and D.M. Britton, Ferns and Fern Allies of Canada (1984); Flora of North America Editorial Committee, ed, Flora of North America - North of Mexico: Pteridophytes and Gymnosperms (1993).